Do you have ancestry in Sydney? 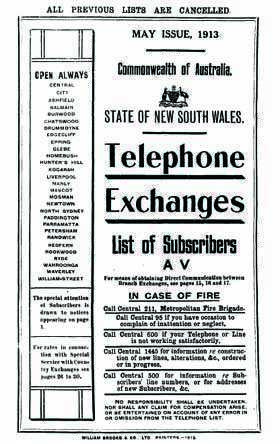 For historians with an interest in New South Wales and its residents, Telephone Directories are a wonderful genealogy tool, as they provide the name and address of people at a particular date. This is perfect for anyone exploring their family history or building a family tree. This collection features 19 directories: 1913, 1936, 199, 1940, 1941, 1942, 1943, 1945, 1946, 1946 (Section 7: North-North Western Districts), 1947, 1948 (section 5: Western Districts), 1948 (Section 6: North Coast Districts), 1948 (Section 7: North-North Western Districts), 1949, 1950, 1951, 1952 & 1953. They include the city and surrounding suburb exchanges of Sydney, such as: the City North, the City South, Ashfield, Castle Hill, Liverpool, Manly, Sutherland and many more.